I totally love the idea. 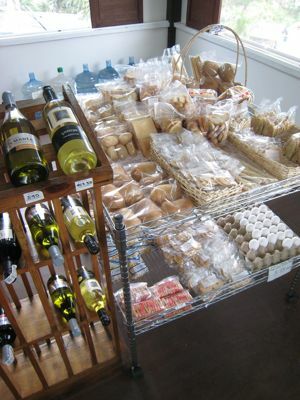 A Gourmet Sari-Sari Store. And the proprietor is frequent commenter Artisan Chocolatier from Cebu, the man that baked the madelienes I featured here. His idea was to put together a small retail food store that would eventually feature some of the best locally produced food items, in addition to all the regular things you might expect to find in a convenience store. Artisan had told me about this concept a few months ago, and even asked if he could “borrow” the word “Suki” as the name (of course I said yes, I certainly didn’t have the rights to it), then in a recent comment on this blog mentioned his store was now open. So last week, when I was in Cebu, I decided to drop by unannounced to check it out. The store is on Veterans Drive, directly across from the old Casino Filipino building just a bit further up than the Marco Polo Plaza Hotel. It’s on the way to Busay… It had only been open a couple of weeks when I got there and stocks were a bit slim, but in addition to the regular sari-sari store items, I was pleased to find fresh milk from a local cebuano dairy cooperative, several types of baked goods like wheat pan de sal, cookies, etc. made in their own kitchens (at a separate location), etc. There are also plans for pre-cooked foods, and the freezers also stock a limited selection of steaks, some of them from another frequent reader and commenter, The Steak Lady. So although I rarely feature businesses of friends, acquaintances or readers, I am more than happy to do a post on this little but intriguing store. I hope more of these types of stores, owned by individuals with a passion for food, join the retail scene across the country. 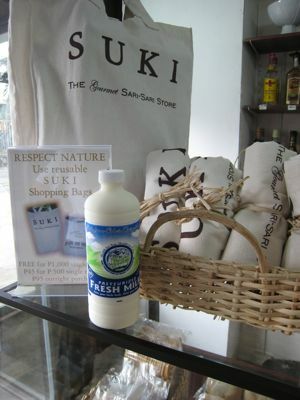 Oh, and one last thing, they also sell re-usable cacha shopping bags, and I bought a few to keep my own marketmanila.com suki bags company. If you are from/in Cebu, check out The Gourmet Sari-Sari Store the next time you are in the neighborhood! Birds of the same feather flock together! Glad to know another wing of purveyor food is now available in Cebu convenient to the buying public. Steak, milk, artisanal bread and pastries and I would imagine eventually Cebuâ€™s pride of native kakanins like the bibingka, biko, and many more varieties of delightful treats housed in one roof. Congratulations and more power to Suki Gourmet Sari Sari Store for taking sari sari store concept to another level! Hats off to MM for featuring this store. 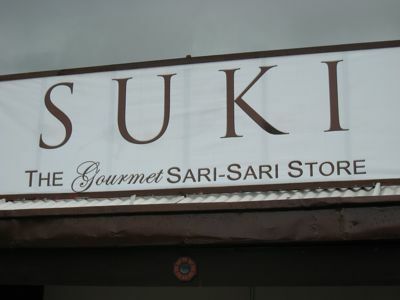 I have already visited “SUKI” a few weeks back to pick up my order of Madeleines. Congratulations to Artisan Chocolatier! I hope more and more entrepreneurs in the provinces come up with this very neat idea! It really helps up the morale of local people of the province. Gosh! I hope someone is here where I live with the likes of Artisan Chocolatier and Steak lady etal! I think it is something like the shops I have seen in Northern France— I noticed the small shopkeepers help their own towns make a name by exclusively featuring their own culinary talents, wines and cottage products…in very cozy and quiant places. Congratulations to Artisan Chocolatier! One more thing to look forward to in my visits. MM and AC, I wonder whether Suki stock MM’s shirts? I feel bad (guilty, envious, everything) I wasn’t able to get the shirts last year. Or anything else MM/other readers may want to sell to raise funds for the school feeding program. Thank you MM!!!! Thank you everyone for all the kind words and encouragements. Here’s my standing offer, anyone looking for a place to showcase their artisanal products, I will gladly provide some space at Suki. I currently carry the bibingka/puto that MM featured a few days ago. I hope to have Manang Lima’s Budbud kabog soon. I also have fresh homemade european style butter and fresh heavy cream made from the Natural fresh milk produced right here in Cebu. Most branded fresh milk is ultra-pasteurized (cooked to 280F for 2 seconds and then quickly chilled) to extend shelf life but sacrifice taste and flavor, the local milk is pasteurized at a lower temperature but for a longer time period to preserved the natural taste of the milk and still kill all the harmful bacteria. Whether the milk is ultra-pasteurized or pasteurized, once opened and refrigerated, both are only good for a week. The only advantage of ultra-pasteurization is that it can be stored(unopened) at room temperature for 6 months. Our agreement with the local dairy coop is that they replace any bottle not sold after 3 days from our receipt. This ensures that our fresh milk is no more than 4 days old from the time the cow was milk. So which would you rather have….REALLY FRESH Milk or Fresh Milk thats been harvested over a month ago? AND MM….your T-shirts, bags, Jams, etc. will always have a special spot at the store!! What a fantastic concept! Congratulations to the Artisan Chocolatier… we’ve got so many amazing products, and with the right packaging, there’s no reason why local can’t go gourmet! Way to go, Artisan Chocolatier! More power to you and I hope you open a store in Manila soon. You certainly have a winner of a concept. Umm…what’s the deal with the chocolates? I didn’t see any! You’ve got to at least carry Toblerone candy bars. Congratulations! I’m curious about your product line! Maybe you’ll come up with a mail order site? Like ship to Manila, for pick-up at the Domestic Airport? Interested in the European-style butter and heavy cream.. but then again, maybe these won’t ship well. sigh. This is a must-go-to next time we visit Cebu. I really like the bags. Congratulations! Great concept, ang galing, so many positives – supports local produce, encourages small home-based operations, promotes our native food tradition, environmentally-friendly… all the best and good luck! congratulations to artisan chocolatier for his store and i wish you success on this endeavor. I’m currently looking for local growers of organic vegetables, herbs, spices, meats and poultry (meat & eggs). Would love to carry them in the store!!! Also finished products with all natural ingredients (having no artificial flavoring and preservatives) will get my attention. my friends and i are planning on going to cebu this april. would make it a point to drop by your store. i love fresh dairy products and local produce! will pass by your store tom after ocular in tops. Congratatulations Artisan Chocolatier! Planning to go up to Marco Polo for Holy Week but looks like I’ll have to go there earlier to check out your store. And yes please , please do carry organic food. You won’t believe how close to impossible it is to get them in the local supermarkets. I am definitely not the slimmest in this group but I am committed to a healthy lifestyle. It would be great if you can have a healthy food choices corner in your store. well Done and congratulations to artisan chocolatier. Will visit you when we go to cebu later this year. Am eager to try the dairy products. What a great effort. Congratulations to Artisan Chocolatier! I love the Go Green approach of the katcha bags, you’re definitely doing your share. More markets should take on this boutique shopping concept because sometimes, big is not always better. Is there a website we can visit? I always find interesting things on your site MM, I’m hyperlinking this entry to everybody I know. Yay to everyone! It is great the way we all pull together and root for home-grown and socially responsible ideas, businesses, comments. CONGRATULATIONS and GOD bless you! I will definitely visit your store when i am in Cebu!!!! Hi, i went there a few nights ago and got some madeleines and the pan de chocolat… all yummy and well priced. Looking forward to more stuff, congrats! Sayang I was just there (Marco Polo Plaza Hotel for a convention) last January – had I known I would have dropped by for a visit. i’m curious. your web link, where is it based exactly – and where are the chocolates, cookies, etc made and shipped from? florida or philippines? I was based in the U.S. until my return in the 3rd quarter of last year. The reason why I have a Florida chocolate fountain rental on my website is to assist my fellow Chef that has a Catering and Chocolate fountain rental business in that part of Florida. I use to provide the chocolate truffles for his catering business. I am now based in Cebu and have just kept the website “as is” until I start producing the chocolate confections locally. Hello. I ll be in Cebu (Montebello villa hotel) for the promotion and marketing of our high end made in France candies confectionery. I would have been glad to meet you and have you free taste our product. Hello. I ll be in Cebu (montebello villa hotel) from may 8 to 10. I ll be glad to introduce you to our high end made in France candies confectionery. Pls let me know your availability.